Once you’ve created your Square Loyalty Program, you’ll be able to monitor your program right from your Square Dashboard. Square Loyalty integrates with the Square Point of Sale app and your Customer Directory to keep track of your customers’ loyalty status. View a customer’s loyalty status from their profile activity feed to see when they enrolled, points and rewards earned, redemptions, and more. Enrolled in Loyalty: Customers are enrolled in your loyalty program by entering their phone number after an eligible purchase. Earned a Point or Reward: See how many points and rewards were earned and at which locations. Manually Added/Removed Points: See if a customer’s points were adjusted. Automatically transferred balance of points: Customers who may have inadvertently created multiple loyalty profiles have them automatically merged by our system to prevent lost points or rewards. For example, if they used the same card twice but accidentally entered the wrong number, we’ll pick up on it and fix it for you. Read more on how to merge a customer’s profile. Signed up for the Mailing List: See when a customer signs up for your mailing list and if they did so in return for points. When you enable the Collect Contacts feature in Square Loyalty, new customers will receive an SMS message offering an additional amount of points in exchange for their email address. Reward Redeemed: See when customers redeem an earned reward and at which location. Update or correct a customer’s Loyalty phone number from their Customer Directory profile. Sign in to the Customers section of your online Square Dashboard. Search and select the customer in question. Next to Personal Information tap Edit> Update their phone number. If a customer enrolls in your program using more than one phone number, they’ll earn points on duplicate customer profiles. To fix this, you can merge the two profiles and select a phone number for their loyalty program participation going forward. Click Select > Tap the customers in question and click Merge. > Continue. Make sure you select the customer’s accurate phone number in case they have more than one. Confirm your changes by clicking Merge. Merging customers that each have Loyalty accounts associated with them will combine the earned points. Note: Both profiles being merged must be enrolled in your loyalty program in order to select the correct phone number. From here, ensure the customer uses the same phone number they enrolled with when claiming a loyalty point going forward. Scroll to the Rewards section of a customer’s directory profile in your online Square Dashboard to see earned coupons and rewards, and to void any if needed. Sign in to the Customers section of your online Square Dashboard > Directory. Search for your customer by name or phone number. Scroll to the Coupons and Rewards section of their profile, click Manage. Check the box for each coupon you’d like to void. Click Void > Confirm Void. You can view the number of points your customer will earn before you finalize the transaction, during the checkout process in the Current Sale section. To make sure your customers are able to the points earned in a purchase, you’ll need to add them to the transaction. In case your customer has enough points to redeem a reward, Reward Available will be prompted on the current sale before finalizing the transaction. You can add the reward to the current sale by tapping Reward Available and selecting the reward you would like to apply. To edit a customer’s point count, locate their customer profile from your online Square Dashboard or the Square Point of Sale app and assign them the correct number of points. Tap Edit next to their Loyalty status. Adjust points using the + / - signs. Under Loyalty, click Edit above the status bar. Adjust points using the + or - signs. If a customer accidentally links their phone number to the wrong payment card, or vice versa, you can always unlink the two. If you’re not sure which phone number a card was linked to, you can search for the payment in the Transactions tab of your online Square Dashboard using the last 4 digits of the payment card, then clicking Paid By in the payment details to find the customer profile. You can also search for a customer’s profile using their full phone number. Check the box for each of the cards you’d like to unlink. Click Unlink > Confirm Unlink. You can update your Loyalty program anytime with no affect on your customers’ existing, earned points. Navigate to Settings in your online Square Dashboard. Click Edit on the section you’d like to modify. Changes will apply to previously-issued points going forward. For example, if a customer had three of five points and you change to a ten-point program, they will now have three of ten points. Please make sure your customers and cashiers understand the impact of these changes. Changes to reward settings will not impact previously-issued rewards. For example, if a reward was originally 10% off an item and you change to 20%, previously-issued rewards that haven’t been redeemed won’t be updated from 10% to 20%. Once you have your Loyalty Program set up, you can manage the number of points your customers have directly from the Square Point of Sale App or online Square Dashboard, so you’ll never have to worry if your customer misses a point! Your Loyalty Status page is a unique link you can share with your customers, which allows them to use their phone number to check their loyalty status at your business. New customers will also be able to enroll in your loyalty program. You can add your Loyalty status page anywhere you like. We recommend adding it to your website and social media pages, and letting your customers know they can check their status there. Navigate to the Loyalty section of your online Square Dashboard and select Promotions. Under Loyalty Status Page you will be able to view or copy the link of your business’ Loyalty status page. Navigate to the Loyalty section of your online Square Dashboard and select Settings. Under Earning Points locate Expiration > click Edit and select whether you’d like your points never to expire, or select after how long you’d like them to expire. Changes to point expiration will only impact future points earned. Customer’s existing points will expire based on the expiration settings at the time of earning. Expiration will be implemented at the end of the month on the last month of the expiration policy. For example, if the program has a 3 month expiration policy then when a customer earns 100 points on November 1st 2018, their points will expire on February 28th 2018. 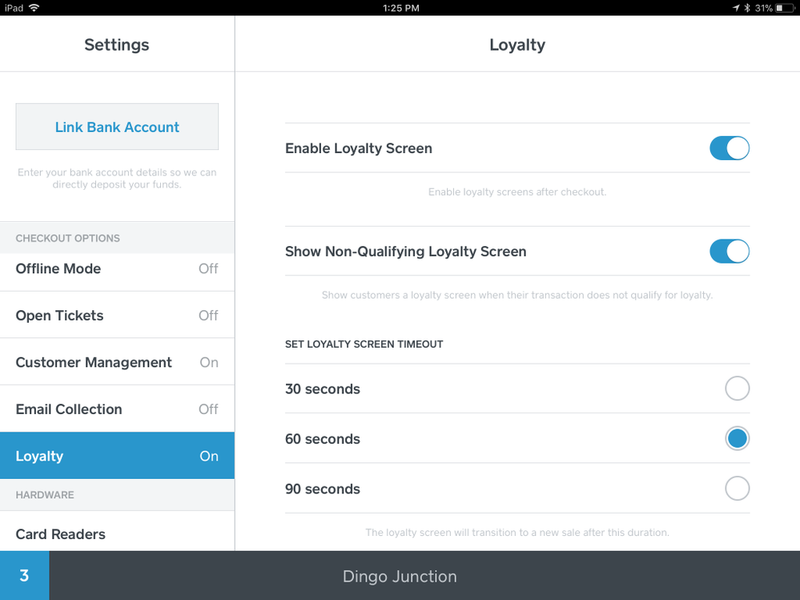 You can edit the way your Loyalty sign in screen shows on your Square Point of Sale for iOS. You are able to turn off the Loyalty screen for non-qualifying transactions, customize the display time of the Loyalty sign-in screen, or turn off the Loyalty sign-in screen completely. Login to your Square Point of Sale. Select the setting you would like to adjust for your Loyalty Program.